Luminosity and afterhours.fm are organizing a dj contest where the best 23 mixes will be broadcasted and the three best djs will win a gig at the Luminosity Before the Energy event! This contest is for upcoming dj's and producers and gives talented people the opportunity to breakthrough in the international dance and club scene. If your specialised in trance and/or progressive then you can join this competition. The three best mixes will be announced as the winners and the DJ's will receive the opportunity to show their skills to the public at the Luminosity presents Before the Energy event at CityHall, Utrecht (NL) on Friday 6 March 2009. We received a total of 103 Sets, it is not possible to upload a submission anymore! The best dj's in number of 23 will play on AH.FM January 30. 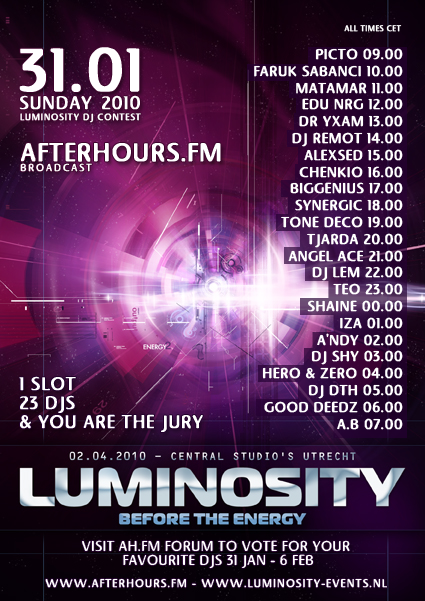 Find the below the broadcasting times of the DJ Contest broadcast at afterhours.fm, all time are CET. Last edited by trancefan0883; Feb 23rd, 2012 at 15:56.
i love luminosity, good organisation, great line-ups. will be there for sure. Last edited by errrrrrik; Dec 29th, 2008 at 16:43. Great competition, brilliant idea. Best of luck to all who entered. Keep The Fire BuRnInG ... !! !